Now, I may be biased.. which is why I had several non-vegan friends try this recipe out and let's just say they all went for seconds so I think that's a good sign, right? There are three ways that you can approach this recipe. If you're all about keeping it simple then by all means do. Use this recipe as a starter guide or as a framework to create your own nachos with store bought products. For example - instead of making your own chips, you can just buy nacho chips from the store. You can also buy 'already made' vegan taco meat (usually available in whole foods, trader joe's, or other local natural food stores). You can use store bought salsa instead of making your own pico de gallo.. and you can definitely use your favorite store bought vegan cheeze sauces as well. The point is... you can make this as easy as you'd like orrrr you can go for the whole 'shebang' and make each part on your own at home. Keeping in mind that homemade is always best - I can't guarantee how your nachos will turn out if you choose to sub for store bought products. Also keeping in mind that many of these store bought products do contain oils and sugars - which would not make this meal 'whole food plant based oil free'. 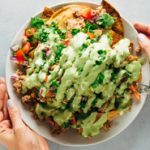 This is the way that I make the nachos and even though it seems a bit overwhelming at first (ahh how many recipes does it take to make one nacho recipe?!) 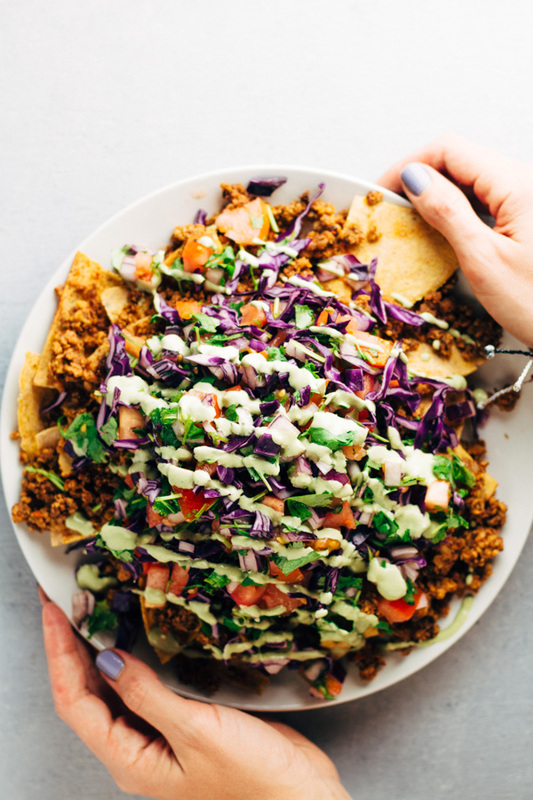 please take a step back, take a deep breathe, and read the following words - you can make the BEST homemade-from-scratch-oil-free vegan nachos in about an hour give or take. That's not too bad right? Yes, you'll be cooking non stop and doing lots of multi tasking but the end result is so so sooo worth it. Honestly, that is what makes *this* vegan nacho recipe extra special, making it from scratch. So what's the third option I mentioned? 3. Part homemade, Part Store-bought. If making everything from scratch just seems unrealistic for you then go ahead and buy a few of the items already made. I do this myself sometimes when I'm short on time. You can definitely find good quality guac already made in stores. You can use store-bought salsa instead of pico de gallo. In this way, you'll have a few of the items ready to go and you'll just have to make a few things at home yourself. Win-Win! Remember you can always plan ahead and that's something I actually recommend. The vegan walnut meat is a great meal prepping item because you can make it, store it in an airtight container in your fridge and just reheat it the next day when you are ready to use it. You can also make the cheeze sauce the night before but I wouldn't make it any more far in advance than that because vegan sauces tend to sour quickly (like within 2 days)! Nachos have a lot going on - but it's always worth it in the end! Make this for yourself and someone special or double the recipe for a larger group. Nachos make for great appetizers or a side dish in small portions, or make a meal out of it and serve a whole plate worth of nachos! Either way, you can't go wrong. If you end up with left over walnut taco meat, pico de gallo, guac, or vegan cheeze sauce - you can make raw vegan romaine lettuce tacos! Do you have a recipe for the vegan sour cream? ?